What is a Spinal Cyst? Cysts are fluid-filled sacs that are commonly caused by infection. Cysts can develop anywhere on the body but when they develop near the spine it can lead to various painful and potentially serious conditions. Most spinal cysts develop in the sacral area around the tailbone. What Can Cause a Spinal Cyst? Cysts develop for several reasons. Some people have cysts from birth and others are caused by aging or other degenerative processes. In the case of synovial cysts, the condition may develop because of the body producing more fluid in the joint to compensate for degeneration. A patient with a spinal cyst may not have any symptoms if the cyst remains small and stable. If, however, the cyst grows to a significant size and/or presses on nearby nerves, it can cause symptoms that include pain, leg weakness, and loss of bladder or bowel control. Spinal cysts tend to cause pain when a person is still for long periods of time or assumes certain positions. Many patients can reduce the severity of symptoms by frequently changing positions and moving around more often. There are several different types of cysts that can form within the spinal cord. 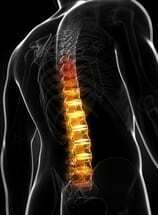 What Are the Treatment Options for Spinal Cysts? Spinal cysts that are not growing quickly or causing symptoms may not require treatment. Dr. Federico P. Girardi will continuously monitor the cyst for any changes in development. Some patients with mild symptoms find that changing positions and moving around more often helps but can still seek treatment. Dr. Girardi may recommend steroid injections to reduce inflammation and discomfort as the first course of treatment. If the spinal cyst is causing moderate to severe pain or growing quickly, Dr. Girardi may recommend surgery. The goal of the procedure is to drain or remove the cyst. In some cases, Dr. Girardi may recommend spinal fusion surgery. This is common when there is a likelihood of new cysts developing within the spinal cord. "Dr Girardi and his staff were highly professional. They were well informed about my spinal problem and had fully reviewed my MRI and other xrays prior to seeing me. Dr Girardi spent about 15 minutes discussing my problems and examining me. He then showed me the current MRI and xrays, clearly showing me the problem that I had and what the surgery required in order to to repair the problem, and relieve me of the pain. He was very thourough in his review of my problem and listened to me carefully." After Dr. Girardi removes or drains the cyst he recommends that patients limit their activities for several weeks. This will help the area heal faster. Then, patients can slowly increase their activity level. Patients commonly have some pain for up to one week. If your spinal cyst procedure also includes fusion of the joint, recovery could take several months. Patients will need to avoid any movements that may interfere with healing, such as lifting heavy objects, bending over and twisting your body. Dr. Girardi may provide you with a back brace to keep the spine stabilized during recovery. Physical therapy is beneficial for some patients who undergo fusion surgery for spinal cysts. The program may begin approximately six weeks after the surgery, and they may need to continue physical therapy for a few months. Treating spinal cysts by fusing the joints may have some risks. The surgery changes the way that your spine works, and more pressure may be placed on the joints that were not fused during the surgery. This may lead to joint degeneration and other problems. Other complications from spinal fusion surgery do arise in a small percentage of patients. The issues typically relate to improper healing of the joints. In addition, patients who smoke are at greater risk for developing complications from spinal cyst fusion surgery. A spinal cyst may not be problematic if it remains small and stable, but cysts that interfere with the surrounding nerves can cause issues and should be evaluated for treatment. To learn more about spinal cysts schedule a consultation with Dr. Federico P. Girardi by calling (212) 606-1559 today.